Teachers union contends sweetheart rate charged; MPS officials deny this. Marva Herndon, co-chair of Women Committed to an Informed Community, and Kim Schroeder, president of the Milwaukee Teachers’ Education Association, held a news conference to share concerns with the lease rates MPS charges charter schools. Photo by Dave Fidlin. 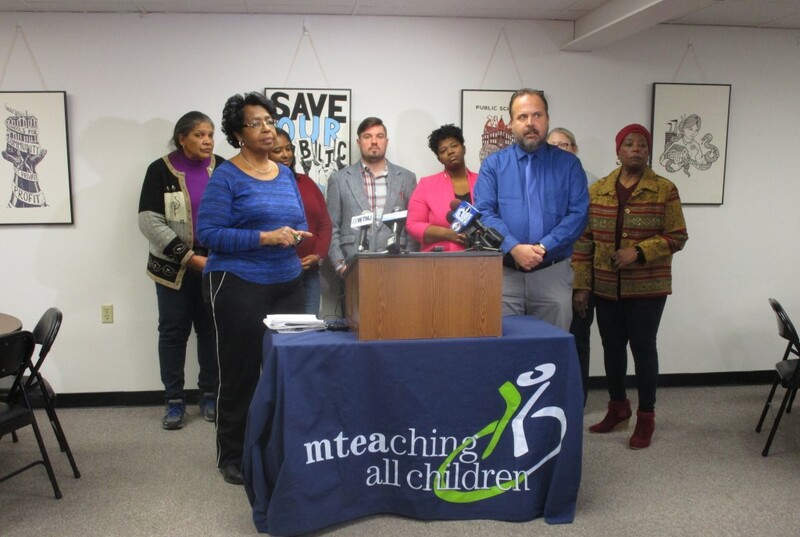 At a press conference yesterday afternoon, representatives of the Milwaukee Teachers’ Education Association accused Milwaukee Public Schools administrators of charging below-market rents for charters using district-owned facilities. Specifically, they contended that Carmen High School of Science and Technology, 5496 N. 72nd St., was undercharged. But the contract was approved last night for another year by members of the Milwaukee School Board’s Administration, Finance and Personnel Committee. However, some questions were raised regarding the standards used by MPS in determining the rates, and board members have demanded more information be presented about this at a future meeting. According to district documents, Carmen officials will pay the same amount — $639,540 — for a one-year contract extension, which would kick in July 1 and last through July 30, 2019. Schroeder, other MTEA representatives and several advocacy groups sounded off yesterday on the rental costs, which they allege starve MPS of financial resources at a time when budgetary constrains are growing especially tight. “This is self-induced pain,” said Marva Herndon, co-chair of an advocacy group, Women Committed to an Informed Community, which is banding together with MTEA and taking aim at the lease rates. The issue is a particular sore point for the union because Carmen is among many charter and choice schools that do not employ union teachers. The MPS’ communications office did not respond to a request for comment following the news conference, but a recording of MPS’ Committee on Accountability, Finance and Personnel in December sheds light on the district’s methodology for charging rental fees. As for Carmen’s northwest campus, Gina Spang, MPS’ chief of staff, said at this meeting that the rate is consistent with the figures assessed at other charters across the district. An adjustment or rethinking in how MPS assesses rental fees at Carmen for the next school year “would impact other non-instrumentality charters in our portfolio,” Spang said. But at last night’s board meeting, board member and former MPS teacher and union member Terry Falk questioned whether Carmen’s rate is lower because the school claims not to use certain classrooms, which thereby lowers the rate, even though that space would not be usable for any other purpose by MPS. MPS officials responded that they operate “off a checklist” to determine the rents, to which Falk and other committee members responded that they want to see this check list. “We need transparency,” Falk told Urban Milwaukee. Board members have asked the administration to provide this information at the committee’s next meeting. While some MPS charter schools use union teachers, “non-instrumentality charters” like Carmen are by definition allowed to hire their own staff, who are not considered MPS employees. According to MPS’ website, 19 charter schools currently exist. But representatives of Carmen contested this at last night’s meeting, contending their school offers a quality education that is attractive to many parents and students.